This spherical container has been engineered to house the most scientifically valuable cargo imaginable – samples brought back from the Red Planet. Image released Oct. 29, 2013. European engineers have built a novel new container that could bring precious samples of Mars safely back to Earth. Though no Mars sample-return mission is firmly on the books, the European Space Agency has supported the development of a proof-of-concept container built to keep Martian samples in pristine condition as they journey from their home world all the way back to Earth. A video of the Mars sample capsule shows how it is expected to open and close when in use. "It incorporates mechanical systems covering structural, thermal and mechanisms engineering but also communications, antennas and power," Laine added. 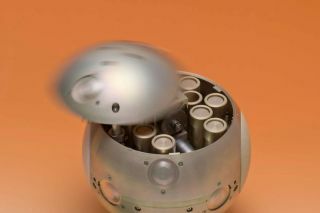 The 9-inch (23 centimeters) spherical container holds 11 sealed receptacles, including one designed to capture a sample of Martian air. Weighing less than 10 pounds (4.5 kilograms), the sphere should protect the samples in temperatures below minus 10 degrees Celsius (14 degrees Fahrenheit) during the long journey to Earth, ESA officials said. One of the most challenging missions for robotic exploration, a sample-return effort would allow scientists to work hands-on with materials from Mars in their well-equipped labs rather than rely on a robotic proxy on the Red Planet's surface. Sample-return is thus widely regarded as the best way to look for evidence of Martian life. Many researchers also view the strategy as a necessary step before a manned mission, with the idea that returning Martian rocks to Earth should be technologically easier than bringing astronauts home. But a sample-return mission wouldn't be as simple as placing Martian rocks in a bag, flying them back, and dropping them on the nearest lab table. "Because there is the potential, however remote, that the samples contain alien life, we have to comply with strict planetary protection protocols not to bring them into contact with Earth's biosphere," Laine said. After a rover fills the container with carefully selected samples, the sphere will be launched into orbit until captured by a rendezvous spacecraft. A radio emitter and retroreflectors for close-up laser ranging should simplify the encounter, officials said. The container will then be placed within a larger bio-sealed vessel, which will then fly to Earth and crash-land on our planet's surface. "In effect, the parachute technology is not reliable enough — which means the container must be able to withstand a crash landing without a parachute," Laine said. "The mission design therefore does not include any parachute, and the capsule literally falls from Mars onto Earth, decelerated only by the pressure on the heatshield through Earth's atmosphere, and by the impact at landing." The current capsule is a proof of concept only, but it is fully functional, having undergone testing in simulated thermal conditions and a shock test at 400 times Earth's gravitational pull, officials said. The primary contractor, French company Mecano I&D, and ESA continue to refine the design of the sample return container in hopes of putting it to use in the not-to-distant future.